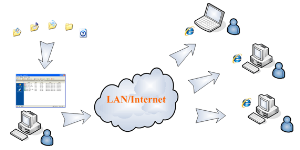 I’ve earlier shared online services for sharing huge files using file uploading servers, but sometime there could be instances like sharing files only on Local Area Network (LAN) in that case you can try CC File Transfer a web based file sharing application to share files, photos, music and video with your friends on LAN. Files can also be uploaded onto the server from which other users using a web Browser can download them.Files can be dragged and drop files into CC File Transfer, users can also upload files to the server from the webrowser. Download Files with web browsers or download managers. Upload File to your friends from web browsers. Supports large file transfer ie., more than 4G also. Resume Download and Multithread Download support and Compatible with most popular download managers. Supports folders browsing and zip downloading. Downloads based on IP-address and user credentials authentication. Friendly URL’s can also be used instead of IP Address which requires signing up CCFile.net.